Original publication date: Friday June 15, 2007. This spectacular 'blue marble' image is the most detailed true-color image of the entire Earth to date. A new NASA-developed technique estimates Earth's center of mass to within 1 millimeter (.04 inches) a year by using a combination of four space-based techniques. The more accurate frame of reference has applications ranging from improving estimates of global sea level rise to improving our understanding of earthquakes and volcanoes. Humans have yet to see Earth's center, as did the characters in Jules Verne's science fiction classic, 'Journey to the Center of the Earth.' But a new NASA study proposes a novel technique to pinpoint more precisely the location of Earth's center of mass and how it moves through space. Knowing the location of the center of mass, determined using measurements from sites on Earth's surface, is important because it provides the reference frame through which scientists determine the relative motions of positions on Earth's surface, in its atmosphere and in space. This information is vital to the study of global sea level change, earthquakes, volcanoes and Earth’s response to the retreat of ice sheets after the last ice age. The accuracy of estimates of the motion of Earth's center of mass is uncertain, but likely ranges from 2 to 5 millimeters (.08 to .20 inches) a year. Donald Argus of NASA's Jet Propulsion Laboratory, Pasadena, Calif., developed the new technique, which estimates Earth's center of mass to within 1 millimeter (.04 inches) a year by precisely positioning sites on Earth's surface using a combination of four space-based techniques. The four techniques were developed and/or operated by NASA in partnership with other national and international agencies. Results of the new study appear in the June issue of Geophysical Journal International. 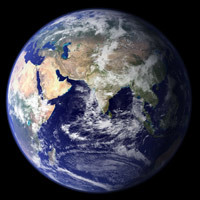 Scientists currently define Earth's center in two ways: as the mass center of solid Earth or as the mass center of Earth's entire system, which combines solid Earth, ice sheets, oceans and atmosphere. Argus says there is room for improvement in these estimates. Argus argues that movements in the mass of Earth's atmosphere and oceans are seasonal and do not accumulate enough to change Earth's mass center. He therefore believes the mass center of solid Earth provides a more accurate reference frame. Argus says this new reference frame could make important contributions to understanding global climate change. The inference that Earth is warming comes partly from observations of global sea level rise, believed to be due to ice sheets melting in Greenland, Antarctica and elsewhere. In recent years, global sea level has been rising faster, with the current rate at about 3 millimeters (.12 inches) a year. Uncertainties in the accuracy of the motion of Earth's center of mass result in significant uncertainties in measuring this rate of change. 'Knowing the relative motions of the mass center of Earth's system and the mass center of the solid Earth can help scientists better determine the rate at which ice in Greenland and Antarctica is melting into the ocean,' Argus explained. He said the new frame of reference will improve estimates of sea level rise from satellite altimeters like the NASA/French Space Agency Jason satellite, which rely on measurements of the location and motion of the mass center of Earth's system. Scientists can also use the new information to more accurately determine plate motions along fault zones, improving our understanding of earthquake and volcanic processes. The new technique combines data from a high-precision network of global positioning system receivers; a network of laser stations that track high-orbiting geodetic satellites called Laser Geodynamics Satellites, or Lageos; a network of radio telescopes that measure the position of Earth with respect to quasars at the edge of the universe, known as very long baseline interferometry; and a French network of precise satellite tracking instruments called Doppler Orbit and Radiopositioning Integrated by Satellite, or DORIS.